The four letter word terrifies me. Every time I pull a pan out of the oven and peel back the aluminum lid, I cringe. Will it be fluffy or mush? Rice is the standard by which cooks in our kitchen our measured. There are roughly seventy two hundred grains of rice in a cup, and in our industrial size kitchen, we literally cook millions a week. 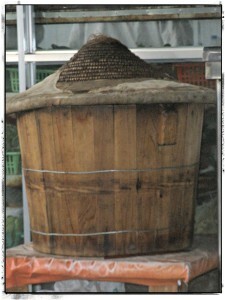 But we don’t have an authentic rice machine like the eateries in China (pictured above). We cook rice in commercial ovens, each holding 230,400 grains. And each head cook boasts of a different recipe. Today in the kitchen, we tested the three different rice recipes, each calling for the same amount of rice but different portions of liquid. One called for no oil and a shorter baking time and scalding hot water, one called for twenty cups of tap water and one swearing by two gallons. We made all three recipes, using eighty cups of rice (576,000 grains) and five industrial baking pans. Add 1 1/4 gallons tepid water to one sixteen cups of rice and one half cup oil into a four inch industrial pan. Seal with an industrial aluminium lid. Peel off lid and fluff.